Patented worldwide, the GoTubb features an ingenious design that allows you to open and close it with one hand only. Just squeeze the sides and the lid is released. To close, simply press back on. For everything that you can’t squeeze out of a GoToob, there’s GoTubb. The GoTubbs work great with pills, knick-knacks, snacks, vitamins, change, bits-n-pieces, you name it. A recessed, textured labelling area resists being rubbed off. And the transparent tops let you see what’s inside without opening them. The small .9 cu.in. 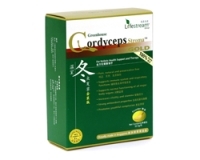 (14cc) size is perfect for a few pills, a stack of quarters, or two sets of earplugs. The larger 5.3 cu.in. (86cc) size is great for holding a bit more of almost anything. 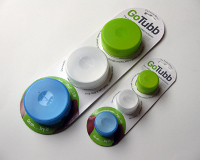 Both GoTubb sizes come in convenient three-packs, in clear, blue, and green colors. The GoTubbs are food-safe (FDA), completely recycleable (#5 plastic), and they're 100% BPA-free, PC-free, and phthalate-free. GoTubbs are water-resistant, not water-proof. They are not designed for use with fluids (that's what the GoToobs are for! ).